FOR many years I have regarded the Pentateuch simply as a record of a barbarous people, in which are found a great number of the ceremonies of savagery, many absurd and unjust laws, and thousands of ideas inconsistent with known and demonstrated facts. To me it seemed almost a crime to teach that this record was written by inspired men; that slavery, polygamy, wars of conquest and extermination were right, and that there was a time when men could win the approbation of infinite Intelligence, Justice, and Mercy, by violating maidens and by butchering babes. 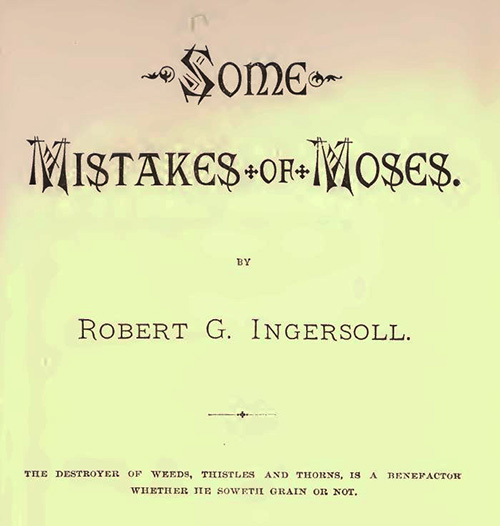 To me it seemed more reasonable that savage men had made these laws; and I endeavored in a lecture, entitled "Some Mistakes of Moses," to point out some of the errors, contradictions, and impossibilities contained in the Pentateuch. The lecture was never written and consequently never delivered twice the same. On several occasions it was reported and published without consent, and without revision. All these publications were grossly and glaringly incorrect. As published, they have been answered several hundred times, and many of the clergy are still engaged in the great work. To keep these reverend gentlemen from wasting their talents on the mistakes of reporters and printers, I concluded to publish the principal points in all my lectures on this subject. And here, it may be proper for me to say, that arguments cannot be answered by personal abuse; that there is no logic in slander, and that falsehood, in the long run, defeats itself. People who love their enemies should, at least, tell the truth about their friends. Should it turn out that I am the worst man in the whole world, the story of the flood will remain just as improbable as before, and the contradictions of the Pentateuch will still demand an explanation. There was a time when a falsehood, fulminated from the pulpit, smote like a sword; but, the supply having greatly exceeded the demand, clerical misrepresentation has at last become almost an innocent amusement. Remembering that only a few years ago men, women, and even children, were imprisoned, tortured and burned, for having expressed in an exceedingly mild and gentle way, the ideas entertained by me, I congratulate myself that calumny is now the pulpit s last resort. The old instruments of torture are kept only to gratify curiosity; the chains are rusting away, and the demolition of time has allowed even the dungeons of the Inquisition to be visited by light. The church, impotent and malicious, regrets, not the abuse, but the loss of her power, and seeks to hold by falsehood what she gained by cruelty and force, by fire and fear. Christianity cannot live in peace with any other form of faith. If that religion be true, there is but one savior, one inspired book, and but one little narrow grass-grown path that leads to heaven. Such a religion is necessarily uncompromising, unreasoning, aggressive and insolent. Christianity has held all other creeds and forms in infinite contempt, divided the world into enemies and friends, and verified the awful declaration of its founder — a declaration that wet with blood the sword he came to bring, and made the horizon of a thousand years lurid with the fagots flames. Too great praise challenges attention, and often brings to light a thousand faults that otherwise the general eye would never see. Were we allowed to read the bible as we do all other books, we would admire its beauties, treasure its worthy thoughts, and account for all its absurd, grotesque and cruel things, by saying that its authors lived in rude, barbaric times. But we are told that it was written by inspired men; that it contains the will of God; that it is perfect, pure, and true in all its parts; the source and standard of all moral and religious truth; that it is the star and anchor of all human hope; the only guide for man, the only torch in Nature s night. These claims are so at variance with every known recorded fact, so palpably absurd, that every free, unbiased soul is forced to raise the standard of revolt. We read the pagan sacred books with profit and delight. With myth and fable we are ever charmed, and find a pleasure in the endless repetition of the beautiful, poetic, and absurd. We find, in all these records of the past, philosophies and dreams, and efforts stained with tears, of great and tender souls who tried to pierce the mystery of life and death, to answer the eternal questions of the Whence and Whither, and vainly sought to make, with bits of shattered glass, a mirror that would, in very truth, reflect the face and form of Nature’s perfect self. These myths were born of hopes, and fears, and tears, and smiles, and they were touched and colored by all there is of joy and grief between the rosy dawn of birth, and death's sad night. They clothed even the stars with passion, and gave to gods the faults and frailties of the sons of men. In them, the winds and waves were music, and all the lakes, and streams, and springs, the mountains, woods and perfumed dells were haunted by a thousand fairy forms. They thrilled the veins of Spring with tremulous desire; made tawny Summer s billowed breast the throne and home of love; filled Autumn s arms with sun-kissed grapes, and gathered sheaves; and pictured Winter as a weak old king who felt, like Lear upon his withered face, Cordelia’s tears. These myths, though false, are beautiful, and have for many ages and in countless ways, enriched the heart and kindled thought. But if the world were taught that all these things are true and all inspired of God, and that eternal punishment will be the lot of him who dares deny or doubt, the sweetest myth of all the Fable World would lose its beauty, and become a scorned and hateful thing to every brave and thoughtful man. WASHINGTON, D. C., Oct. 7th, 1879.